In our common language, pimples are also identified as spots or zits. Basically pimples are small papule or pustule which occurs mainly due to sebaceous glands. These sebaceous glands are present at the base of hair follicles and it causes pimples when they are overactive. 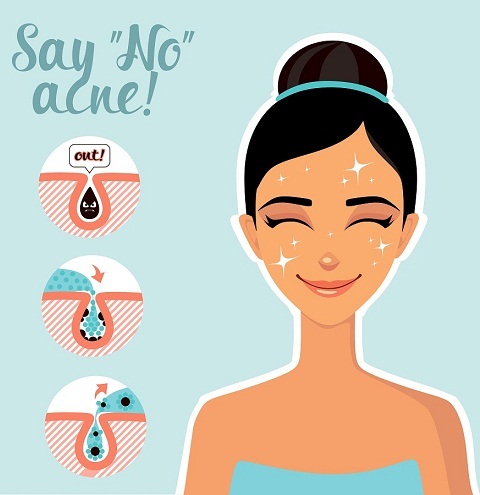 Pimples are flagrant signs of acne, especially when a breakout occurs mostly due to over-exposed body parts such as face, chest, shoulder and back. The sebaceous glands which exists inside the pores of our skin, produces a waxy/oily substance known as sebum in our body to lubricate our skin and hairs. These glands are present all over our skin sites except few parts such as palms and soles. They are highly present on face and scalps. 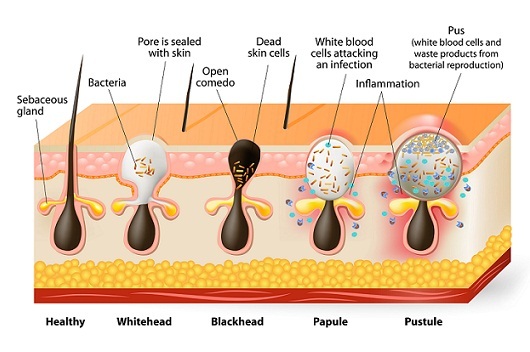 Our skin continuously shed its outer layers and for this the dead skin cells are left behind. As a result they get trapped together by the oily sebum, causing a blockage in the pore. When the pores get blocked they gather behind the blockage producing more sebum from the glands. This blocked sebum contains slow-growing bacteria which are linked to acne. They existence on our skin is harmless however, when they find any suitable conditions, they can reproduce rapidly and become a serious problem. Generally these bacterium feeds off the sebum which produces a substance causing an immune response. This response further leads to inflammation of the skin and spots. Below are the different types of pimples and their symptoms as follows. 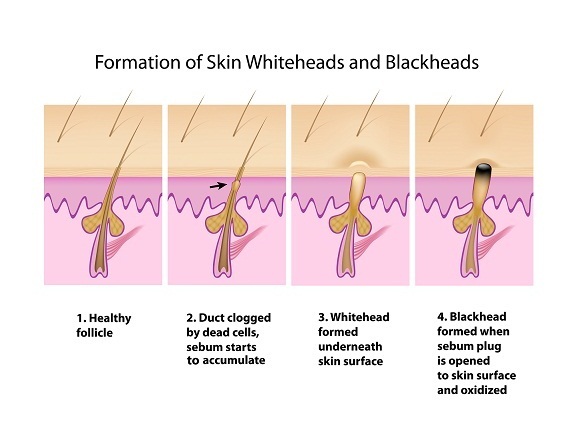 Whiteheads – They are also known as a closed comedo as are very small and remain under the skin. They are small in size and have flesh-colored papules. Blackheads – These are known as an open comedo and are easily visible. They are appear on the surface of the skin and are black in color. People mistakenly believe these are caused by dirt, because of their black color and scrub their faces vigorously to remove them. Scrubbing them does not help to remove them but it can irritate the skin result in other problems. Papules – These are small rounded solid bumps which rise from the skin. These bumps are often pink in appearance. Pustules – These are pimples which are full with pus in them. They get clearly visible on the skin surface as its base is red and the pus is formed on the top of it. Nodules – These are similar in structure to the papules but are much larger. They are the most painful one as they are embedded deep within the skin. Cysts – These types of pimples are clearly visible on the skin surface. They are filled with pus and are usually painful commonly causing the scars on the skins. 1. Many of us start picking at the skin in order to remove a pimple or acne blemish which causes more scars on the skin. 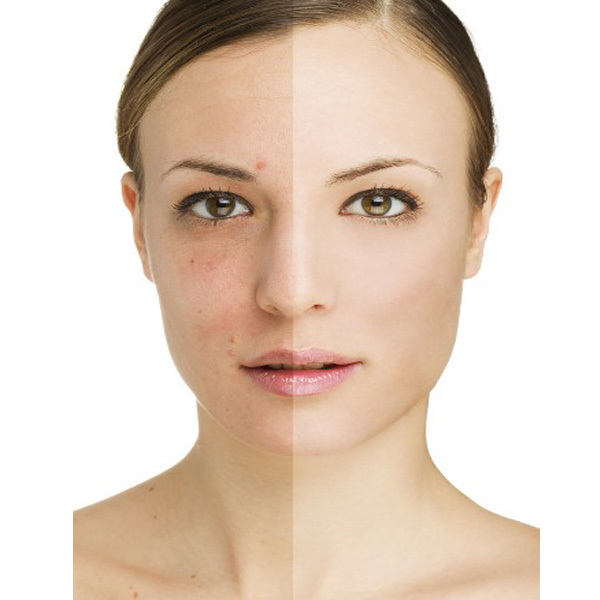 Avoid picking if an acne breakout occurs on your skin as it worsens the acne inflammation causing scars. Instead, continue to cleanse and moisturize with natural skincare ingredients. 2. Use herbal remedies along with botanical ingredients for getting rid of pimples. Botanical ingredients are products that do not contain any harmful chemical additives or preservatives in them. Herbal extracts are made with dried plant material. You can use it by diluting the herbal extracts with other ingredients such as water, rose water, or other carrier oils. 3. Honey has the ability to remove impurities from the skin since it contains some cleansing and disinfecting properties in them. 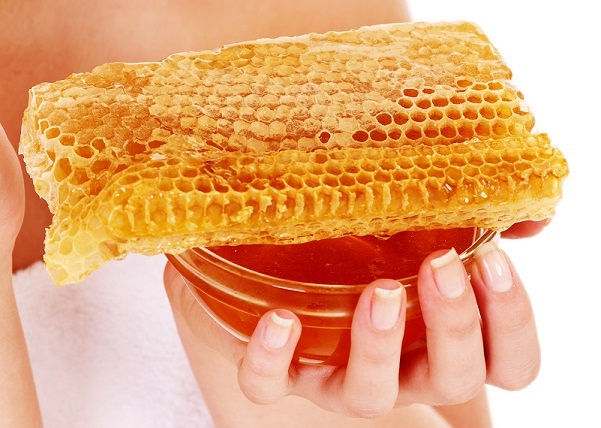 Honey helps in killing the bacteria and fades away the acne scars. Also the nourishing properties of honey are absorbed by the skin making it a natural moisturizer without any oil content in it. Honey is also an excellent natural cleanser. 4. Aloe vera is one of the most commonly used plants which contain abundant nutrients and unique healing properties. Drinking aloe vera juice on a regular basis helps to detoxify and nourish the body from the inside. It also clears the impurities and gives a glowing complexion. The aloe vera plant contains nutritionally powerful detoxification properties that eliminate waste and toxins away from the body. 5. 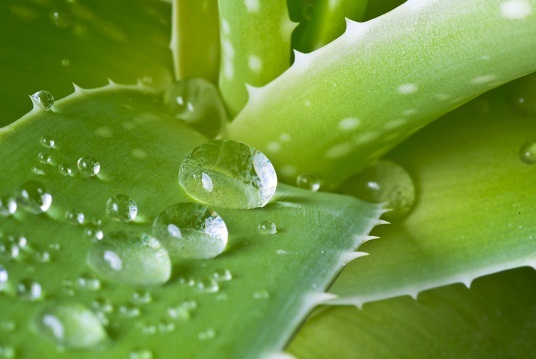 Other than aloe vera juice, the gel from the aloe vera plant provides cleansing and moisturizing benefits to the skin. This natural skincare ingredient besides containing several vitamins, minerals and antioxidants, it also contains antibacterial and anti fungal properties which protects for further skin infections. Simply applying aloe vera gel on the skin prevents infection and cures the pimple. 6. 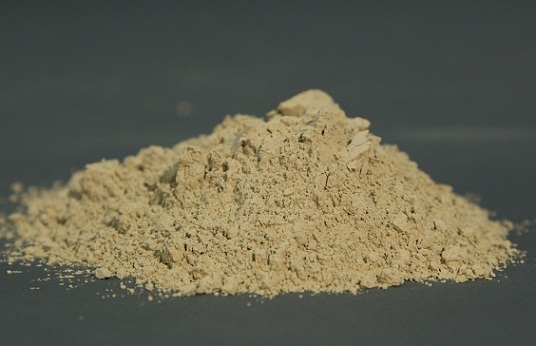 Fuller’s Earth Clay is other natural ingredient which occurs on sedimentary clay and has been used natural cleanser and skin-bleaching agent for centuries. The clay also contains excellent absorbent properties which works great on removing impurities from the skin. This clay is generally mixed with simple water or rose water. Fuller’s earth clay can be mixed with rose water, herbal tea or green tea. These liquids make the mud mask more beneficial to the skin by adding extra nutrients from the liquids. Don’t get upset if nothing helps you out for clearing pimples or acne. In many cases, pimples or acnes or other skin diseases are the results hereditary traits. Following are few tips which can help you to deal with such pimple problems. 1. 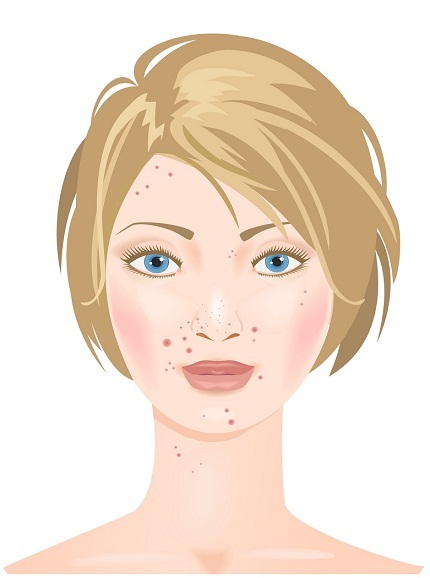 Many people often think that pimples or acne are infectious which is certainly not true. You cannot catch pimples from another person as they are not infectious. 2. Skin gets suppler when we drink adequate amounts of liquids such as water. Drink adequate amounts of water and plenty of raw or fresh squeezed fruits juice blends. You can drink freshly prepared fruit juices which are nutrient dense and have detoxification and healing properties to the skin. 3. People who eat a lot of diary products and high glycerin foods are more likely to attract pimple. Avoid eating foods that you’re allergic to as they register themselves as toxins in your body system. 4. Cleansing your skin with harsh products can take away too much of your natural oils worsening the problems by inducing the glands to produce more oils. 5. Not all herbal ingredients are suitable for skincare. Some products can be too harsh (most essential oils), while others can be too oily (most plant butters and carrier oils). There are a few that are recommended for facial skincare depending on how oily or dry your skin is. So be selective while buying such products. 6. When our skin sweats, it removes toxins which in turn help to clear pimple. So start exercise for keeping yourself healthy as well as safe from pimple problems. Though the skin should be cleansed and moisturized properly after sweating. 7. Lack of rest keeps the body from healing both emotionally and physically. By sleeping we actually take a break from stress and recover our systems so that they can function properly the following day. When our systems function properly, pimples are less likely to occur. ← Previous Story How To Use Apple Cider Vinegar For Acne Scars? Next Story → How To Avoid Pimples On Face Naturally?